https://www.buydirect4u.co.uk/product/toys-games/bentley-kids-range-rover-evoque-white-available/ 6468 Range Rover Evoque 12V Licensed Ride On Car - White https://www.buydirect4u.co.uk/wpcms/wp-content/uploads/2017/03/ROCEVOQ01WT-Charles-Bentley-Ride-On-Car-Range-Rover-Evoque-White-Child-1.jpg 249.99 249.99 GBP InStock /Toys & Games/Ride On Toys/Battery Powered /Clearance /Toys & Games/Ride On Toys /Toys & Games Treat your child to this amazing replica roadster - the Range Rover Evoque ride on car, it is battery operated and an ideal gift for young children. It is an awesome sit in car that delivers the sleek looks of the original but at a fraction of the cost! It can be controlled either by a child using the steering wheel and foot pedals or for extra safety the parents can over-ride the controls at any time using a parent remote control which can steer the car forwards, backwards, left and right this is a handy feature for children who cannot reach the accelerator pedal or cannot yet control the car. This single seated stylish car has lots of incredible features such as a working horn, keyed ignition, front headlights, steering wheel, wing mirrors, gear stick and realistic looking alloy wheels. The car has two speed options - it can go 2-3km/hr or 3-4km/hr. The 12V model has two motors to double the speed and the battery lasts for an amazing 1.5 hours. It also features a unique speaker system enabling realistic engine sound effects as well as an MP3 outlet to play music whilst driving. The body paint work has a sleek finish using real car paint so scratches can be buffed out easily. 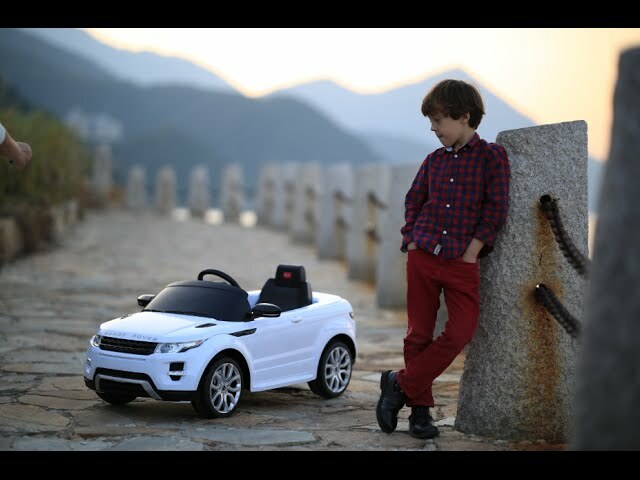 Treat your child to this amazing replica roadster – the Range Rover Evoque ride on car, it is battery operated and an ideal gift for young children. It is an awesome sit in car that delivers the sleek looks of the original but at a fraction of the cost! It can be controlled either by a child using the steering wheel and foot pedals or for extra safety the parents can over-ride the controls at any time using a parent remote control which can steer the car forwards, backwards, left and right this is a handy feature for children who cannot reach the accelerator pedal or cannot yet control the car. This single seated stylish car has lots of incredible features such as a working horn, keyed ignition, front headlights, steering wheel, wing mirrors, gear stick and realistic looking alloy wheels. The car has two speed options – it can go 2-3km/hr or 3-4km/hr. The 12V model has two motors to double the speed and the battery lasts for an amazing 1.5 hours. It also features a unique speaker system enabling realistic engine sound effects as well as an MP3 outlet to play music whilst driving. The body paint work has a sleek finish using real car paint so scratches can be buffed out easily.